The Samsung Galaxy S4 is another smash-hit for the company and is flying off the shelves in various regions across the world. One of the bonuses with the Galaxy S4 is that it has a removable battery, so if you are a heavy mobile phone user you have the option of swapping batteries if you battery dies on you. However, there are ways to get the best out of your existing battery and today we have a video to show you that explains how to maximize the battery life of your Galaxy S4. Although users of the Galaxy S4 have the option of carrying a spare battery or extended battery with them, not everybody wants to have to carry one around. It’s handy then to know how to get the very best out of the battery that you have, and that’s where this 5-minute YouTube video comes in. There are some really helpful tips and tricks available that may not be common knowledge, so it’s worth taking a look and it covers general battery life optimization tips as well as some ideas that are specific for the galaxy S4. The video that we have embedded for you below this story begins with informing us that the amount of widgets on the home screen can really affect your battery life, and so it’s best to run as few as possible. It also goes into detail about shutting extra features off, and then talks about not using live wallpapers if possible to conserve battery life. It then discusses the power saving mode and goes on to discuss how much power is used by the display. 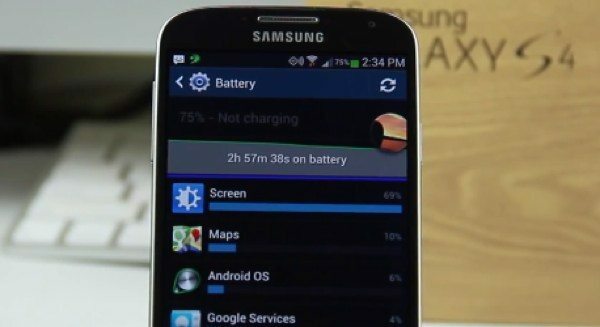 We think this video is a really good resource and offers a really clear explanation on how to maximize the battery life of your Samsung Galaxy S4. If you have the Samsung Galaxy S4 we’d be interested to find out if you found this video about improving the battery life useful? Let us know by sending your comments using the box below. Live wallpaper draining the battery is BS. It only draws power when it’s onscreen, which is practically never when in an app or on standby. Robert, whats wrong with you? “live wallpaper is kinda gay”. What a stupid comment! Acting gay= a good thing, in my book!